before reducing my gluten intake i had never eaten quinoa before. i don't know what turned me off from it, but i was just a little taken back by it. a nutty, seedy, rice-type thing? no thanks. but, after not having other carbohydrates in my life anymore, such as pasta, i realized that this grain is a great substitute for these carbohydrates and a great way to fill you up. so for the past six months i have been on a major quinoa kick. i was looking back on my recipe post and trying to re-do a lot of them (a very long process that will hopefully be coming in the next few months) when i realized i didn't have a single post on quinoa. so- i am going to start off with a simple one. but a good, basic one that anyone can make. i find that i often make quinoa salads for lunch. i will prep them the night before and grab one in the morning to ensure i have a hearty lunch. as my love for tomatoes has grown over the past several months (like really grown, see here), my love for greek flavor food has grown as well. 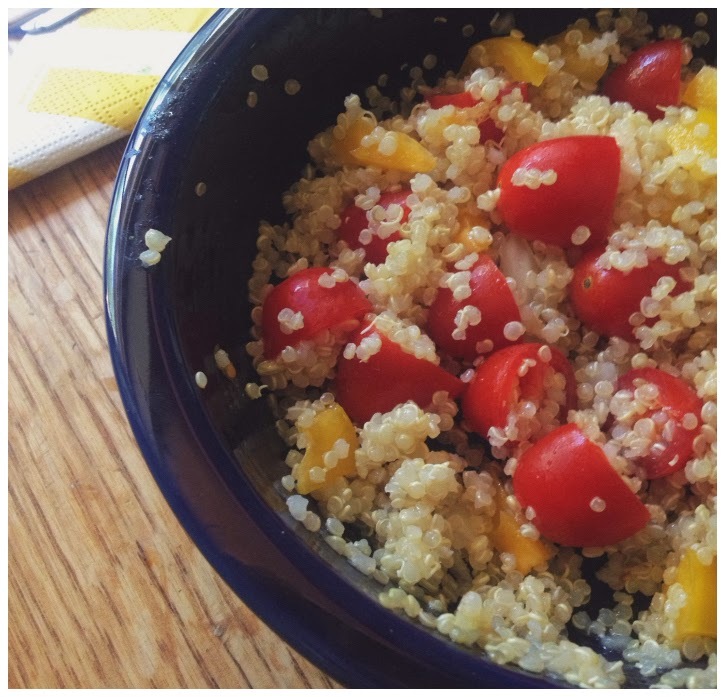 here is a recipe for one of my favorite quinoa salad, great for a quick lunch, or a side for dinner! 3. in a large bowl, add the cooked quinoa, peppers, cucumbers, onion, feta, parsley, and vinaigrette. stir until everything is combined and tastes lovely! then add the tomatoes, it is best if you fold these in so the juices don't get everywhere!